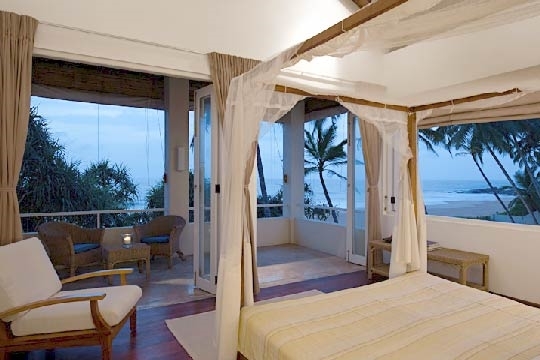 With four bedrooms, Araliya is the largest of Sri Villas’ trio of boutique properties (three-bedroomed Nisala and two-bedroomed Sagara being the others) that sit side-by-side overlooking the panoramic expanse of west coast beach and deep blue sea. Ideal for either one or two families, the villa has two serene suites upstairs with a shared sea-view balcony and two smaller, more colourful bedrooms – one of which has a TV and DVD player – on the ground floor that are ideal for the kids. Living and dining space designed for contemporary living spills through wide open doorways onto a shared garden with elongated swimming pool, variety of palms, tranquil beachside massage hut and grassy lawn accented by the melody of birdsong and waves. A little rickety gate to the front of Araliya leads onto a wide golden beach that stretches for half a kilometre between two rocky outcrops; it’s mostly deserted except for the odd fishermen, the occasional turtle and a scattering of strollers at sunset. You can swim and body board in the sea here during the November to April season although the villa’s inviting lap pool – only a few footsteps from the villa - is an absolutely glorious place to while away the hours of the day, and faces right out towards the sunset; its generous size is definitely a bonus, as you can really enjoy a proper swim. Araliya’s location on a quiet stretch of beach was stunning. 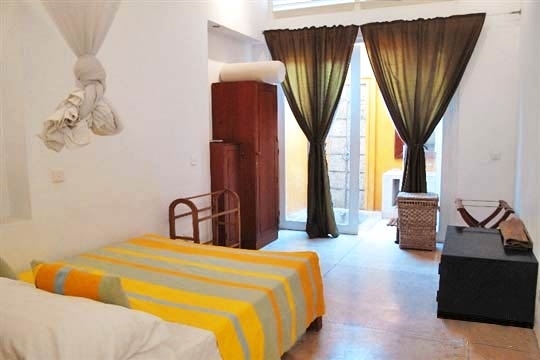 Araliya is well-suited for families – either one large or two small – with its double suites upstairs and two colourful bedrooms (including a twin) on the ground floor. There’s a basket full of toys, special menus for the kids, a palm-shaded garden plus an easy-to-watch-over pool. Araliya’s location on a quiet stretch of beach that’s more popular with turtles than people was stunning. 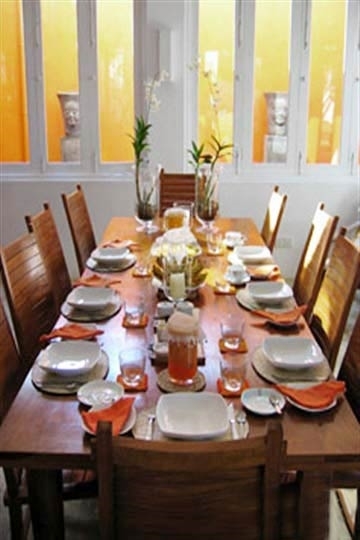 If you’re looking for conviviality and don’t mind sharing facilities then Araliya is a good choice. The houseboy assigned to our villa was very polite and helpful, as were the rest of the staff who took over the cooking, cleaning, securing and beautifying while we relaxed and topped up our tans on the terrace. The food was good (there was lots of choice), the smiles genuine and their experienced system of dealing with guests shone through. I liked that fresh juices were left in the fridge for us to help ourselves to (or brought to us in chilled glasses) and that we could order whatever we liked, when we liked. Typically guests choose to pay their food bills via a grocery system (staff doing the shopping and presenting you with receipts), which we did; however you could otherwise opt to pay $40 per person per day for full-board. A great beach and lots to do nearby. We particularly liked Araliya’s semi-private shady garden to the front and its potential for a movie room. 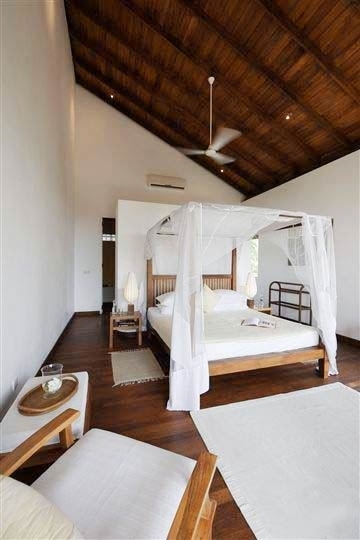 When booked together, the three Sri Villas properties offer a total of nine bedrooms – excellent for big family celebrations or large groups of friends. We felt that privacy was a little lacking at Araliya, at least on the ground floor; perhaps because it is the closest villa to the staff area and kitchen. Unless you hire all three villas together you won’t know who you will be sharing the pool and other facilities with, which some guests might see as a disadvantage – although it could also be a great opportunity to make new friends! 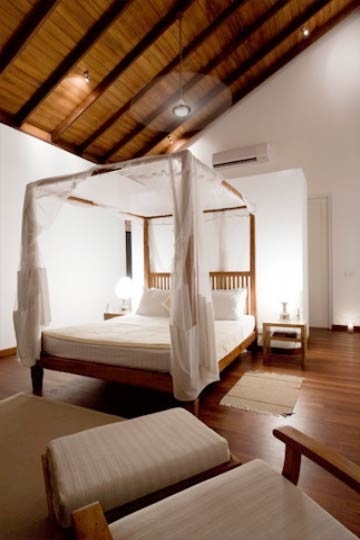 Araliya is located to the south of Induruwa, and only a ten minute drive to the famous resort of Bentota. 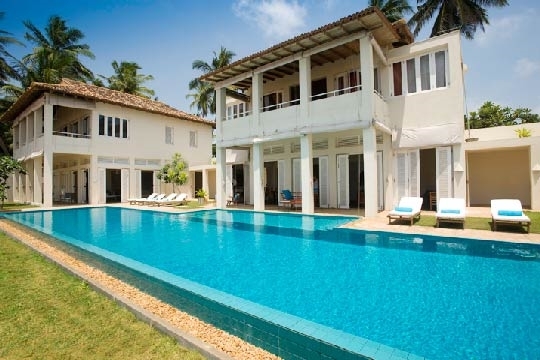 Situated between the main Galle Road and the extensive golden sandy beach, Araliya is neighboured by the other two Sri Villas properties, Nisala and Sagara. Village homes in Induruwa are generally strung out along this stretch of coastline with small boutique hotels and bigger resorts scattered in between. Because of the southwest monsoon, it’s best to visit between December and April as the sea can be rough and the winds strong at other times of the year. 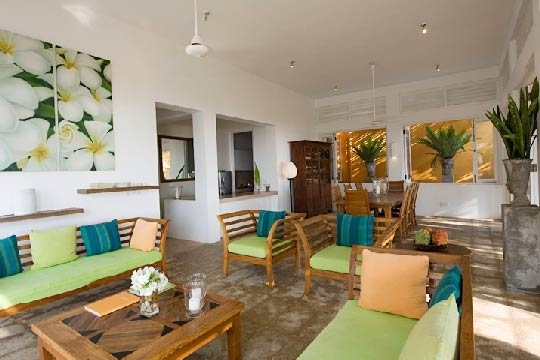 Araliya is situated on the left hand side of Sri Villas, overlooking the ocean. 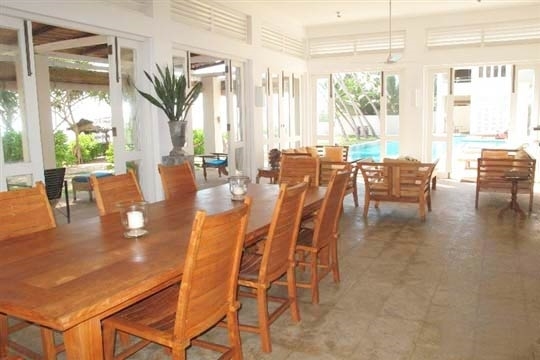 Using plenty of local materials in its construction, the villa has a contemporary tropical design reminiscent of Bali, with features such as tall folding glass doors, high louvered panels, granite floors, a soothing water feature, modern timber furnishings, calming stones and earthy colour schemes. On the ground floor are two bedrooms – a double and a twin - best suited to children. 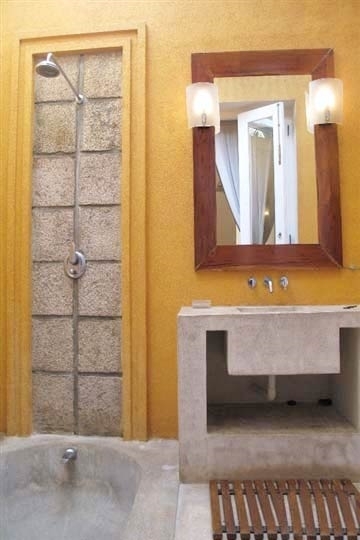 Whilst only one of them has a view (of the pool), the other is situated in the middle of the house and instead of a window has an ensuite bathroom with sky-lit shower and shallow granite tub. The pool-view room has a cabinet with TV and DVD player and since the single beds in this room convert into sofas, it could also be used exclusively for watching movies. To the front of the ground floor is an open-plan living and dining space with folding doors that open onto a private front and communal central terrace beside the swimming pool. The room is furnished with a dining table for eight, relaxed seating and a few easy chairs on the veranda for soaking up the views. 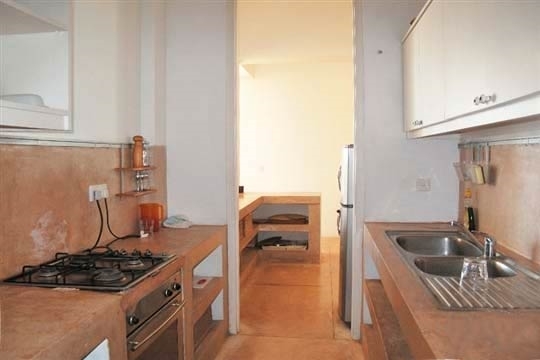 Overlooking the living area is a polished cement worktop or bar that leads into a narrow kitchen with oven, hotplates, a fridge/freezer and cupboard storage. Steps at the rear of the house lead up to the first floor where two identical suites are located. Each has a four-poster double bed draped with mosquito netting, built-in wardrobes, a few easy chairs, and folding doors onto a shared front balcony with views through the trees out to sea. 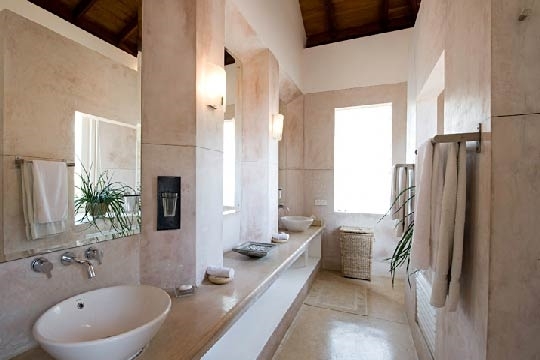 The right-hand suite overlooks the swimming pool whilst both have identical concrete-finished ensuite bathrooms with twin washbasins and a shower. All four bedrooms have air conditioning and ceiling fans. Downstairs, a hallway leads out to the staff area and main kitchen at the back. 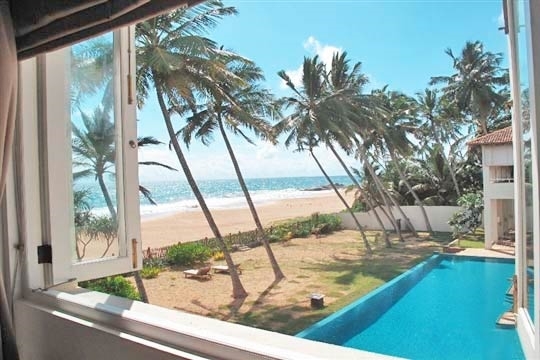 4 bedroom villa located in Bentota, West Coast. 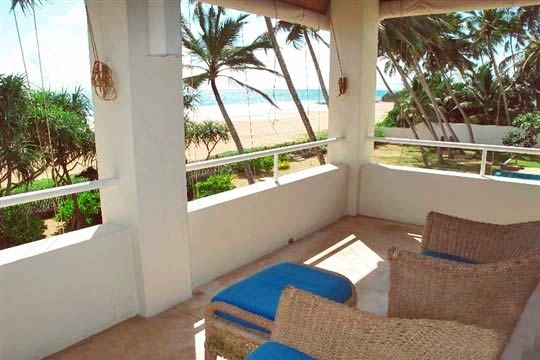 Ideal for Beachfront, Body and soul, Kid friendly, Sensible for seniors, Room with a view, Perfect for weddings.